As many of you know, there is a new running magazine in town. It's the creation of my friends Simon Freeman and Julie Kummer, and is beautiful on many levels. Printed on heavy stock it feels quite satisfying in one's hands. The artwork is fantastic. 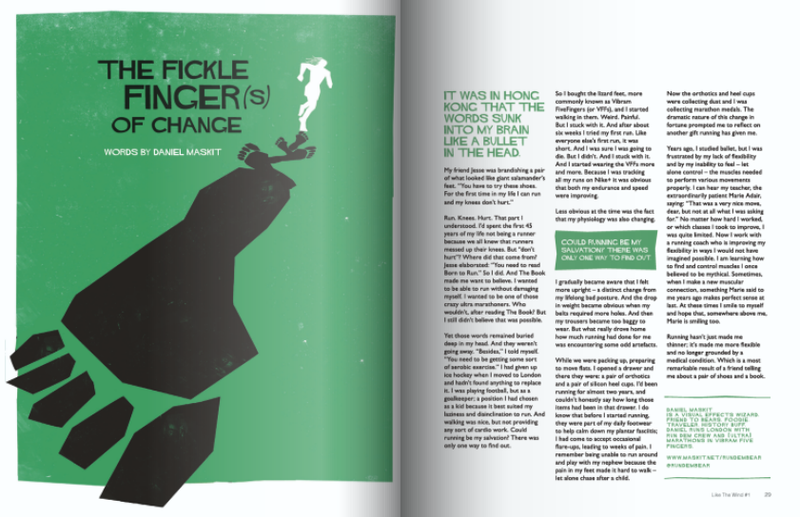 The writing is a refreshing change from your typical running magazine. No diet hints. No magical training tips. No reviews of some piece of kit you absolutely must have. Nope, just stories about running. How people became runners, why people run, what running means to someone. All very personal. The magazine is called Like The Wind, and you can order your own copy at their online shop. I can offer you a taste of what is in the magazine as I happen to have written one of the pieces. The artwork is the creation of Andy Wyatt. Andy read the piece, and offered to create something for it. As I work in the film business he thought that I should have my very own Saul Bass-inspired film poster. I hope you like the artwork as much as I do. For those who wonder about such things, yes that is meant to be me on the poster. And no, it isn't a coincidence that there are five footprints. This page contains a single entry by Daniel Maskit published on February 8, 2014 5:18 PM. In which I run the Nike Women's Marathon and am welcomed as an honorary member of Gyal Dem Crew was the previous entry in this blog. The London Marathon Street by Street is the next entry in this blog.